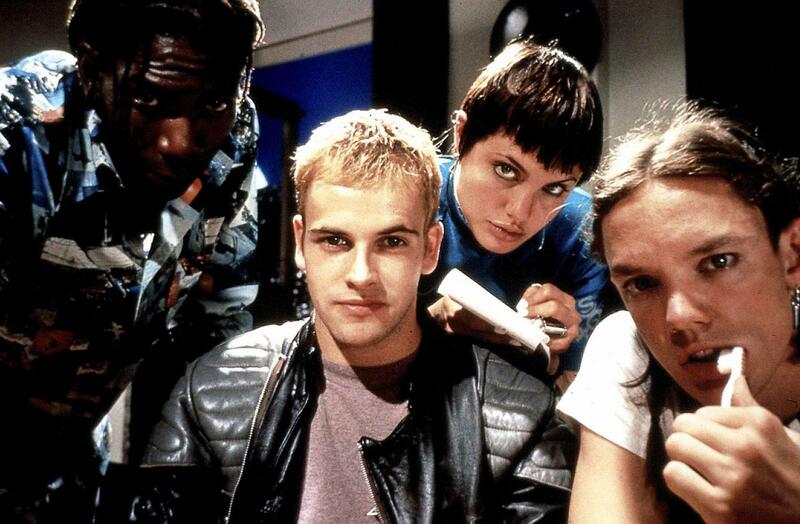 “Hackers” is a 1995 movie that has achieved cult classic status, particularly in internet communities, for its hilarious depiction of a group of hackers and their unrealistic use of the internet. The movie provided break out early roles for Angelina Jolie, and to a lesser degree Matthew Lillard. “Hackers” director Iain Softley has done very little else of note, with the exception of the Kevin Spacey movie “K-PAX” in 2001 and the movie “The Skeleton Key” starring Kate Hudson in 2005. IMDb lists two movies directed by Softley that have yet to be released: “Curve” and “The Outcast.” Neither film currently has a release date scheduled, however. The cast is a veritable rogues gallery of notables. Angelina Jolie and Johnny Lee Miller lead the way, with Fisher Stevens, Wendell Pierce (“The Wire,” “Selma”), Lorraine Bracco (“The Sopranos”), Matthew Lillard (“Scream”, “The Descendants”, “SLC Punk”), and even magician Penn Jillette and pop singer Marc Anthony filling out the lower rungs of the cast. Miller and Jolie wed soon after the completion of filming, which is a frequent footnote and fun fact attached to the film. Perhaps the most telling thing of all about this movie can be gleaned from looking at the writing credit. “Hackers” was penned by one Rafael Moreu, whose only other writing credit is for the much maligned “The Rage: Carrie 2.” Despite the reception of the script, apparently there was a lot of research put into the script by Moreu, some of which shows up on screen. A number of the character pseudonyms are nods to famous hackers and computer engineering icons (“Babbage,” “Emmanuel Goldstein”), and the central supercomputer in the story is named after William Gibson, an acclaimed and influential science fiction author who coined the term “cyberspace.” It is also reported that members of the cast and crew of “Hackers” spent time attending real hacker meetups and conferences while making the movie. The marketing campaign for “Hackers” included, of course, a website. The design was made in such a way as to give the appearance that it had been hacked by outsiders. This included a number of snarky graffiti messages on top of the promotional materials. One in particular reportedly read “see ‘The Net’ instead,” a reference to the now equally notorious 1995 cyber-thriller starring Sandra Bullock. I admittedly had somehow never seen this movie before, but its reputation precedes it. It is regarded nowadays as a classic bad movie, one of a subset of movies about the internet before anyone really understood how it worked (“The Net” gets the honor of being in this category as well). Honestly, I’m not even sure where to start with this thing. The dialogue? The fashion? The music? Lorraine Bracco? There is a whole lot bad about this movie. The first and probably biggest issue with “Hackers” is the script, which is a mixture of word salad techno-jargon and cheesy 1990s counterculture idioms. As mentioned in the background of the movie, the writer reportedly spent a fair amount of time around hackers while he was writing and preparing this movie. I can’t help but wonder if the hacker community was playing a lengthy practical joke on the production, intentionally feeding Moreu word salad and bad information. I mean, that certainly sounds like the kind of thing the internet community would do nowadays. In any case, the lines that make it into the movie are often cringe-worthy and nonsensical, something that is emphasized by the fact that most of the cast clearly has no idea what they are talking about. Speaking of cluelessness in the cast, Lorraine Bracco deserves a specific call out for her performance. Even though her character is supposed to not understand computers in the story, it is clear that she is incredibly out of place in this movie. She doesn’t get a whole lot of screen time, but her deliveries when she is on screen are just abysmal. She just doesn’t fit in with the rest of the cast, and it stands out like caps lock. 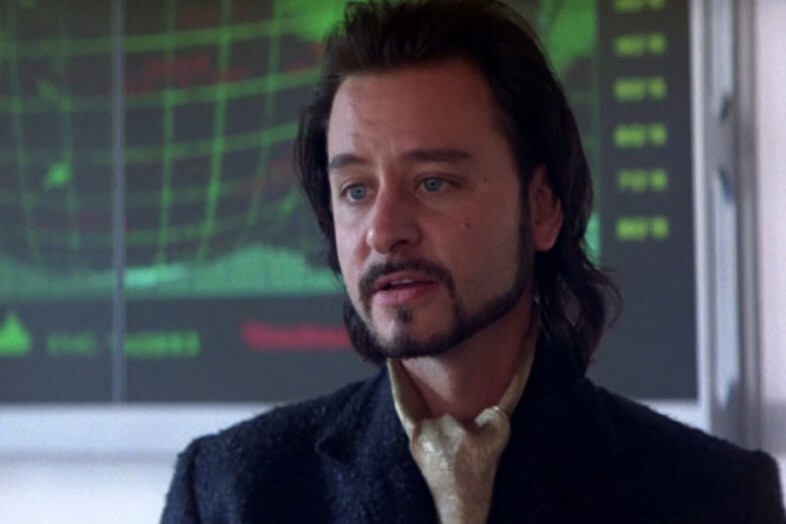 Fisher Stevens plays the antagonist in the story, and is probably the most entertaining element in the movie. He goes well over the top in his portrayal of a sold-out master hacker who holds no loyalties and looks down on the world (“The Plague”). His skeevy condescension comes out in every line he speaks, and it is hilarious. 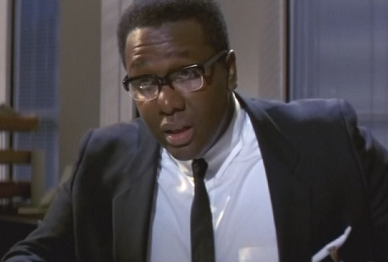 Wendell Pierce, who is best known for his starring roles in the HBO series “The Wire” and “Treme,” plays a secret service agent who is tasked with taking down hackers. He is definitely in a smaller role in “Hackers,” but his ability to integrate comedic timing into serious roles really comes out in this movie. “Hackers” was more or less the breakout movie for both Angelina Jolie and Matthew Lillard. It is fascinating to see how different their roles are in this movie, and how they reflect their ultimate career trajectories. Lillard, unsurprisingly, provides comic relief: setting the groundwork for him to eventually show up in countless stoner movies, as well as “Scream” and the “Scooby Doo” live action films as Shaggy. The way he pulls off the cyberpunk fashion in “Hackers” almost certainly contributed to him landing the lead role in “SLC Punk” as well. Jolie, on the other hand, is probably the most even-keel (and bland) character in the film. Admittedly, I am not a fan of Jolie’s acting: I have never seen anything where she shows much range, and she seems to rely on shallow action leads. In that sense, though (having a career based on being a shallow lead), “Hackers” provides as legitimate of a foundation as you could ask for. Not everything about “Hackers” is bad, though. There are some pretty interesting sets, and there is some intriguing editing here and there. It is also a very colorful movie for better or worse: I thought it worked pretty well personally. 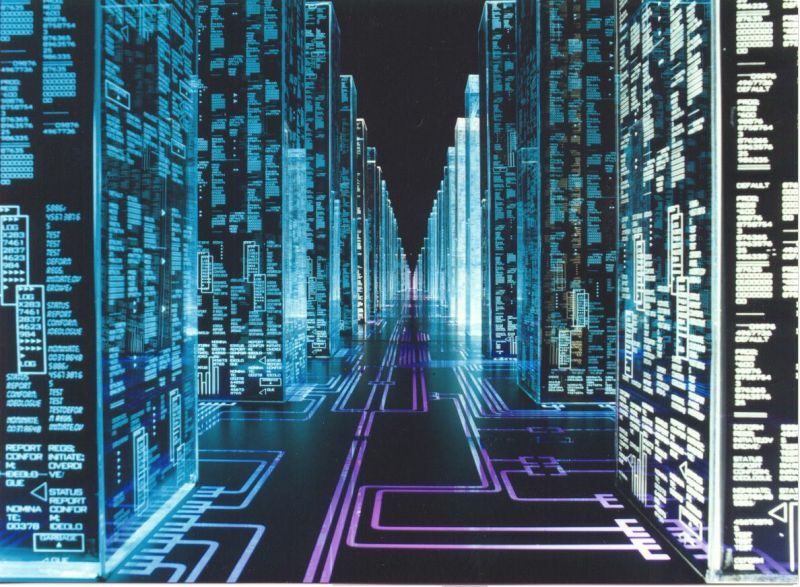 There are a number of “cyberspace” sequences that were created through a mix of practical effects and traditional animation that actually look pretty ok (better than if they had dared CG in 1995). I agree that if you turn off your brain, this is a pretty enjoyable movie. 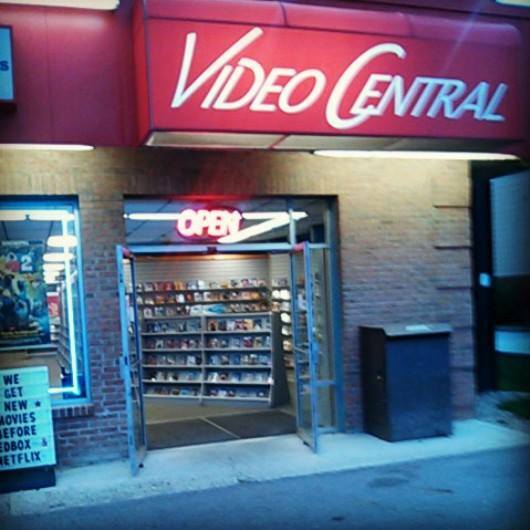 It also benefits a bit from the nostalgia factor it has nowadays, but the flip side of the coin is that all of the floppy discs make the movie hilariously archaic. As a side note, I highly recommend the We Hate Movies episode on “Hackers” for a more in depth look at the plot.